Are you looking to make money off your Cats-that-look-like-Star-Wars-characters Web site? Then start throwing up some Google Ads to let people buy random cat and/or Star Wars merchandise at other sites! 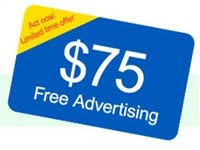 Google is even offering $75 in free advertising if you try their advertising program out. Just fill out the form here and they’ll email you the code and details within 2 business days.